For generations, the familiar red handle and inlaid Swiss cross have been an iconic symbol for anyone who has carried a pocketknife. But because Victorinox and Wenger have both made these official Swiss Army knives, consumers and retailers have often been confused as to which brand was the genuine article. When Victorinox and Wenger knives merge into one brand later this year, however, that confusion will finally become a thing of the past. Technically, Wenger has been part of the Victorinox company for several years, but despite having the same owner, the two companies have continued to operate as separate brands, each maintaining their own identity—and their own Swiss Army knives—in the market. Late last year, however, the owners decided that it would be better if the two knife brands were merged into one. "We could see that having two separate brands was creating a great deal of confusion for consumers, and that wasn't helping either brand," says Rene Stutz, president and CEO of Victorinox Swiss Army, Inc.
"As a way to help eliminate that confusion, we are integrating the Wenger knife business into the Victorinox knife business. The Wenger brand will continue to exist in the watch, as well as the licensing business." 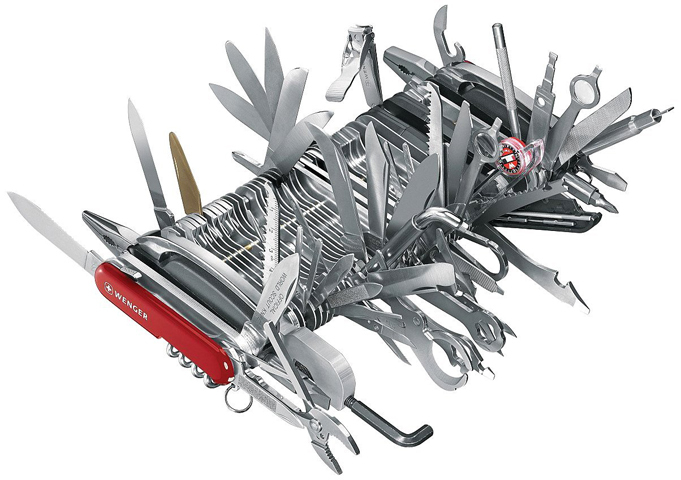 When it comes to the iconic Swiss Army knives, however, starting in 2014, they will all carry the Victorinox name. Although the logistics of the integration are still being worked out, Stutz said that retailers can expect to see an immediate benefit when the merger goes into effect. "The biggest benefit is that we won't be competing with each other anymore," he says. "We can be much stronger together as one brand than we were as two separate companies, and we'll actually be able to offer retailers a better assortment of products than what they're currently carrying." One aspect that won't change despite the merger is the employees who design, create, and distribute the knives. "When we started discussing bringing the two companies together, the first order of business from our owners was that no one should lose his or her job," Stutz says. "The Wenger company will be integrated into the Victorinox group as seamlessly as possible, and everyone who wants to stay on will continue to have a job—from our factories in Switzerland to our sales force across the U.S."
And with the same employees paying the same kind of attention to the details that have made both Wenger and Victorinox trusted names in the knife industry, it's a safe bet that while much will change in the coming months, one thing will remain constant: that same genuine Swiss Army knife so many of us have carried will continue to be an iconic symbol.